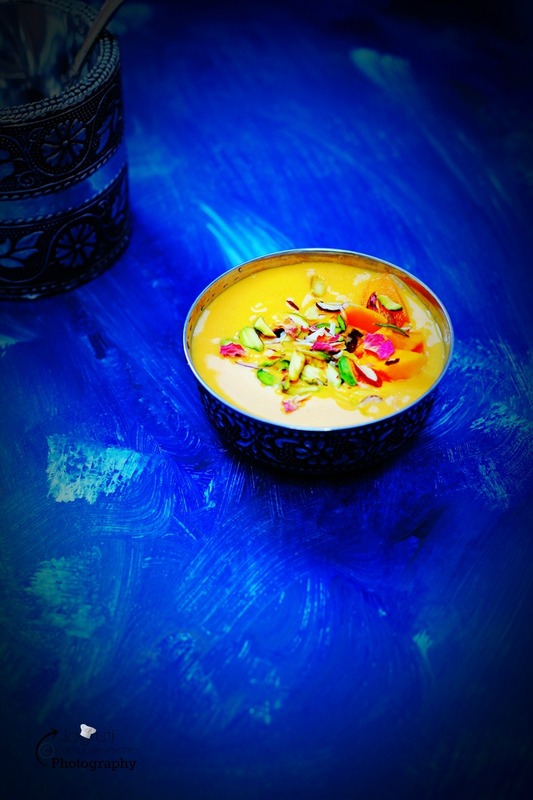 Shahi Mango Paneer Kheer , surely you will be delighted to see this bowlful of dessert on your table. 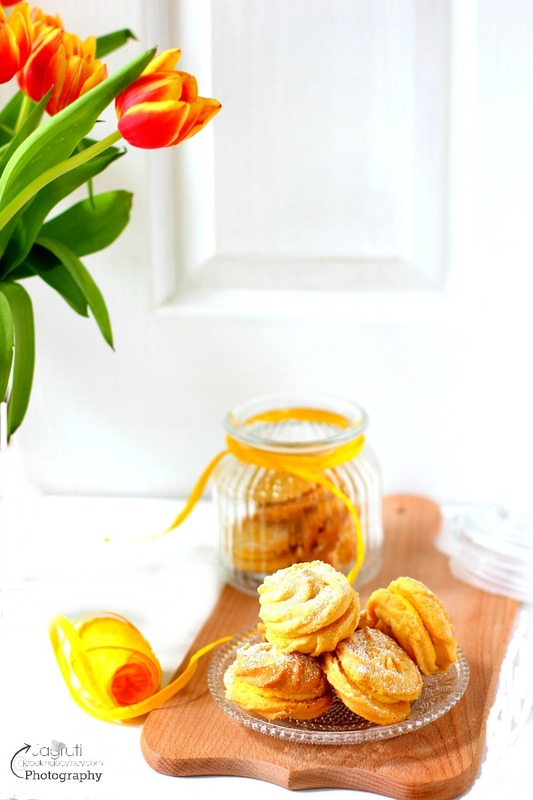 It's taste is Delectable , Rich and aromatic Indian dessert. 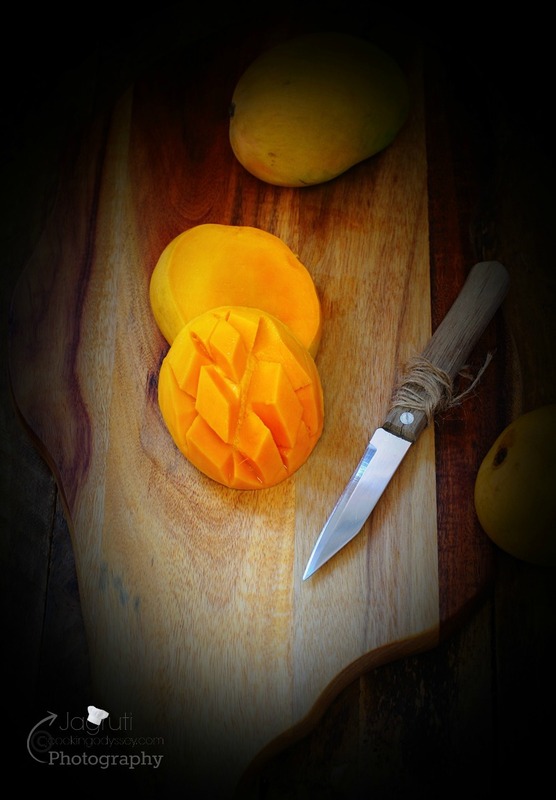 Longer days, trees in blossom and warmer weathers are all signs that beautiful spring is here, and here spring means It's our beloved mango frenzy in bloom , So why not celebrate these mangoes ! Shahi Mango Paneer Kheer, became definitely one of my favourite dessert. This dessert of mine is with little variation. During most of the celebrations in India, Paneer Kheer is served and happily devoured by young and old. Paneer kheer is made using thickened milk, paneer and turned into rich pudding by adding aromatic saffron and nuts. Mangoes being in the season, pretty much going in everything and so I made space for sweet mangoes in creamy and nutty paneer Kheer and what can I say about this make over, Shahi Mango Paneer Kheer turned out marvellous, the creamy kheer turned into an alluring dessert. 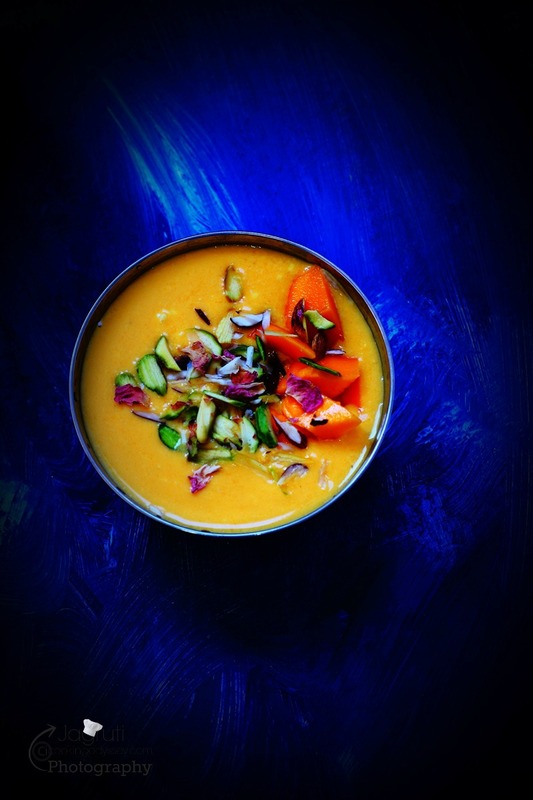 Mangoes, saffron, nuts and thickened creamy milk works so well with each other and definitely blends and creates a sweet and soothing harmony between flavours ! 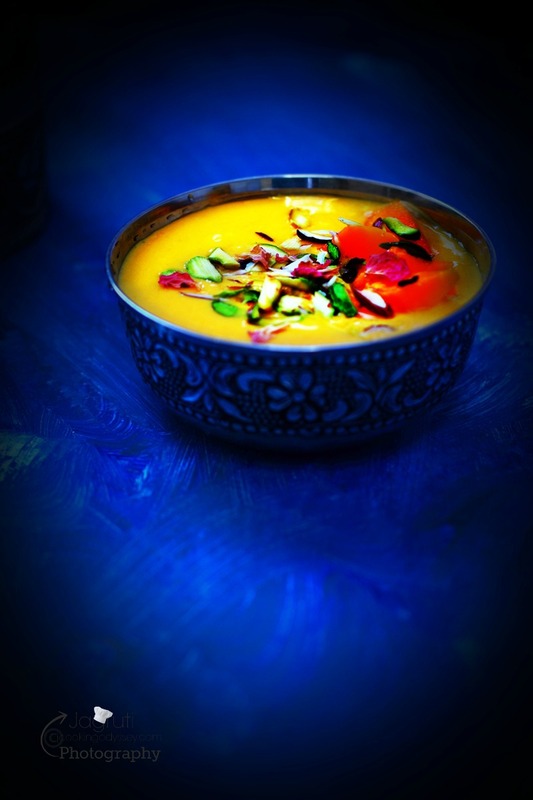 Shahi Mango paneer Kheer, I adorned with aromatic Alphonso mango pieces, rose petals and rich nut slivers. the contrast of garnishing , combination of flavours and exquisite kheer turned out darn delicious, delectable and simply soul satisfying !!! Shahi mango paneer kheer, delectable and delicious Indian dessert made with using milk,paneer, mango and garnished with nuts. In a heavy bottom pan or kadai combine milk and sugar. Bring it to boil and simmer for 10 minutes. Add cream and simmer for another 8-10 minutes. Now add grated paneer and cook the kheer for another 7-8 minutes or until it gets thicken. Add cardamom powder, saffron threads and half amount of nuts..
Let it cool completely and chilled about an hour in the refrigerator. Once chilled add mango pulp and mix well. Once again chill for at least 2 hours. 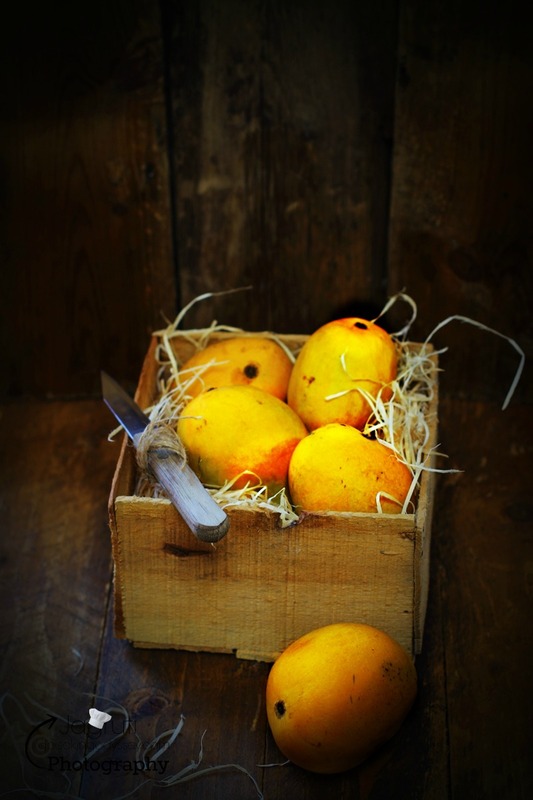 Once ready to serve take out in a serving bowl and garnish with the mango pieces, nuts slivers and rose petals .